You can make delicious, sweet grilled pineapple without ever having to set foot outdoors or light up a grill. Prepare slices or chunks of this nutritious, low-calorie fruit in your oven. Grilled pineapple is a tasty accompaniment to baked ham, a delicious side dish with Caribbean-style chicken or pork, or pairs well with dessert crepes and ice cream for a special dessert. Preheat your oven to 400 degrees Fahrenheit. Spray your grill pan with nonfat cooking spray and place it in the oven to preheat it, too. Peel the pineapple. Cut off and discard the crown, or top. Cut out the pineapple core and cut the fruit into 1/2-inch-thick slices. Remove the hot grill pan from the oven. Place the pineapple slices onto the grill pan. Sprinkle each pineapple slice with a little loose brown sugar and some cinnamon if desired. Alternatively, you can marinate the sliced pineapple in a tropical marinade, which might include dark rum, lime juice and brown sugar, before placing it on your grill pan. Put the pineapple in the oven and grill for 7 to 8 minutes. Remove the pan and turn the slices over, and then sprinkle them with more brown sugar or marinade. Put the fruit back into the oven and grill for another 7 to 8 minutes or until the pineapple slices are golden brown and the sugar is beginning to bubble and caramelize. Be sure not to let it burn. Remove from the grill pan from the oven and serve the pineapple as part of your entree or dessert. To grill the pineapples on skewers, cut the peeled, cored fruit into chunks instead of slices. Thread them loosely onto wooden skewers, leaving a little space between each piece of pineapple. Place the skewered fruit onto the preheated grill pan and put it into the oven. Grill for five minutes, and then turn the skewers and grill for five minutes more. Finally, turn them one more time, and grill for another five minutes. Try topping your grilled pineapple with more brown sugar, whipped cream, coconut or a little honey. 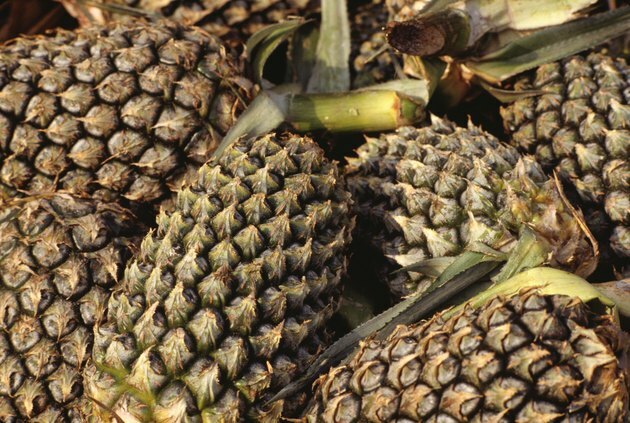 Are Pineapples a Source of Fiber?